At a grand meet in Lucknow a few days ago, the Prime Minister declared that despite what the opposition says, he isnt scared to be seen with industrialists and that they have an important role in nation building. I agree whole heartedlty with the prime minister except that I think he is confusing industrialists with crony capitalists. Crony capitalists don’t build nations, they destroy them. Crony capitalism is a term describing an economy in which success in business depends on close relationships between business people and government officials. It may be exhibited by favoritism in the distribution of legal permits, government grants, special tax breaks, or other forms of state interventionism. 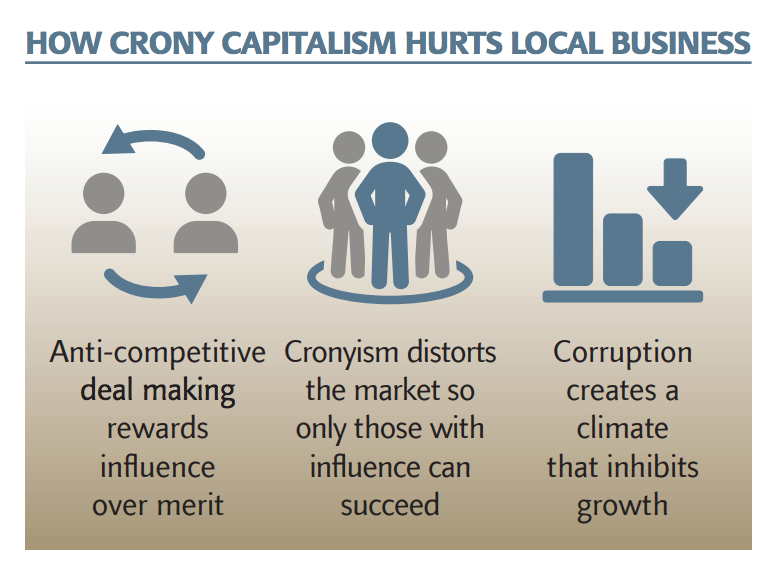 Crony Capitalism is merely an old disease with a new name. In the pre liberalization era the government expoited its right to hand out qoutas to businessmen who might or might not have been qualified or eligible to receive those allocations. In the era of free markets, the government controls fewer assets but remains the biggest spender in areas such as defense and retains control over natural resources such as land and minerals. Crony capitalism has taken center stage in this country over the last four years with a few businessmen attaining notriety due to their close relationship with the government. The single biggest instance of this phenomenon is the Rafale Deal. The Rafale deal between the Indian govenrment and a french company Dassault to buy fighter aircrafts is a text book case in crony capitalism. A carefully structured and negotiated deal by the previous government was thrown out of the window by none less than the Prime Minister who suddenly intervened and changed the terms to favor one particular private corporation over a public sector undertaking. In order to explain crony capitalism in the Rafale deal, let me give you an example that will hit closer to home. Let us for a moment pretend that you are looking to buy an under construction apartment with your life savings. The cost of the apartment must be within your budget, within a certain time period and has to be as durable as possible in your budget. How would you then decide which builder to buy from? You would first look for builders whohave a great track record of quality construction and on time delivery. You would also look for a builder who does not have any financial issues so you can rest assured he wont divert your money to repay his debts or to other projects. Now lets assume you find two builders - one builder is your own son who has struggled for many years in the business and who you have supported through tough times with your own money. The other is your neighbour who is a successful builder, is personally very wealthy and promises to do a good job if you buy his apartment. The apartment in this example is the Rafale jet, the son is HAL, the neighbour is Anil Ambani and you are the country. The only difference is that Anil Ambani’s companies are debt ridden , he has no track record to speak of in aviation and his other forays in the defense sector have failed. So who would you buy your apartment from? There are part of the Rafale deal that are not easily explained by my example but have far reaching consequences. One of these is the absence of technology transfer to India,a condition of the agreement that the Congress led UPA government stood firm on. This has been removed now with the government offering an opaque explanation about its economic viability. The transfer of technology would have enabled HAL to manufacture 108 jets and build on that platform for future requirements. Many indians would have had the chance to work and learn from the process and hopefully build an equivalent indigienous aircraft one day. This is one of India’s largest defense deals that could have served to not only strengthen our armed forces but also provide a platform for other make in India initiatives in the aviation sector. So was technology transfer abandoned because Anil Ambani needed to be rescued from a debt trap of his own making? In order for capitalism and capitalists to create value, markets must not be free to a few but free to many. What the prime minister has been doing over the last four years is systematically consolidating power and money in the hands of a few. He intends to run this country with his band of crony capitalists. This is not only dangerous for the economic system of our country but also for our democracy. Well said Mohan. Detailed explanation..!! My Introduction: Kalpesh Sharma, Maninagar, Ahmedabad. My Expertise: Technical Intelligence, Content Writing, Communication, Public Speaking, Cyber Security, Research & Digital Marketing.